FirmTek will soon be shipping a unique USB 3.0 storage device. Unique? What could be unique about a USB enclosure? I'll answer that soon, but first check out the graphs. We hooked up the FirmTek miniSwap/U3 to the 15" Retina MacBook Pro's left USB 3.0 port. We mounted a 6Gbps SSD and ran some tests. Then we added a second miniSwap/U3 to the USB 3.0 port on the right side, inserted a 6Gb/s SSD, and ran the same tests with the two drives striped (RAID 0). two 6G SSDs = two miniSwap/U3 USB 3.0 enclosures with 6G SSDs -- each connected to a separate USB 3.0 port on the Retina MacBook Pro and striped (RAID 0) using Apple Disk Utility. one 6G SSD = one miniSwap/U3 USB 3.0 enclosure with 6G SSD connected to a USB 3.0 port on the Retina MacBook Pro. WHAT's UNIQUE ABOUT THE MINISWAP/U3? Though the test results in the graphs above were from the 2012 Retina MacBook Pro, we also tested the miniSwap/U3 on USB 3.0 ports of the 2012 iMac, 2012 MacBook Air, 2012 Mac mini. The results were essentially the same. Fast. If you ordered your iMac or Mac mini or MacBook Pro with a slow drive, you don't have to crack it open to install a fast drive. Just pop a fast drive in the miniSwap/U3, install OS X, and boot from it instead. No mounting of the drive is required. No screws. No trays. Just open miniSwap's door, slide the drive in, close the door, rock'n'roll. Use a 6Gbps SSD one minute for a Photoshop Scratch volume. Next minute, dismount and eject that drive to insert a Green 2TB HDD for a Time Machine backup. It mounts without rebooting your Mac. Yes. Hotswap. The miniSwap/U3 runs all standard notebook HDDs and SSDs on bus power. No AC adapter needed. Nice for Apple laptops or even iMac owners wanting minimal clutter and cables in view. No fan. Uses passive cooling through ventilation holes and heat transfer through the aluminum case. Our stress test of a 7200 rpm HDD inside the miniSwap/U3 showed temperatures only a few degrees above that of the internal SSD of the MacBook Pro and the internal HDD of the iMac -- both of which were at idle and are cooled by a fan. The case is made from sturdy aluminum similar to what's used on the Mac Pro. It's designed to be stackable in case you plan to use more than one. We will post the pricing in a few days but suffice to say it will be surprisingly reasonable. 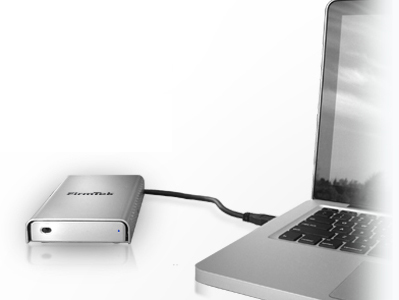 If you are looking for a fast, affordable, convenient, bus-powered notebook storage device for your 2012 Mac with USB 3.0 ports, the FirmTek miniSwap/U3 is definitely worth strong consideration. Soon you will be able to order the miniSwap/U3 direct from the FirmTek online store. See the list of dealers on the Seagate Momentus XT Solid State Hybrid 750G Drive page.